Brace yourself, ’90s kids—our beloved Delia’s is back. Yup, you heard correctly. A revitalized Delia’s is making its emphatic return, with all the crop tops and platform boots you could ever dream of. The new Delia’s is part of a limited-edition collection developed by Dolls Kill, the counterculture cool-girl brand based in San Francisco. The 70-piece collection, which launches today, features an assortment of clothing, shoes, and accessories, ranging in price from $18 to $88 and in sizes XS to XL. Delia’s initially shuttered in 2015 as a result of dwindling sales and lowered foot traffic to its mall stores. The brand made fits and starts of relaunching in following years, including attempts at an e-shop and resurrecting its iconic catalog. However, the effort was slow-moving and we never got the comeback we hoped and dreamed. The partnership between Delia’s and Dolls Kill is a match made in heaven. When Dolls Kills was founded in 2011, the brand built on a foundation of girl power and delivering feminism with attitude. Dolls Kill buying director Christina Ferrucci told us the collection is designed to speak to the women—now in their late 20s and 30s—who grew up with Delia’s and continue to imbue that youthful spirit. Honestly, we can’t get enough of this ongoing ’90s revival trend. 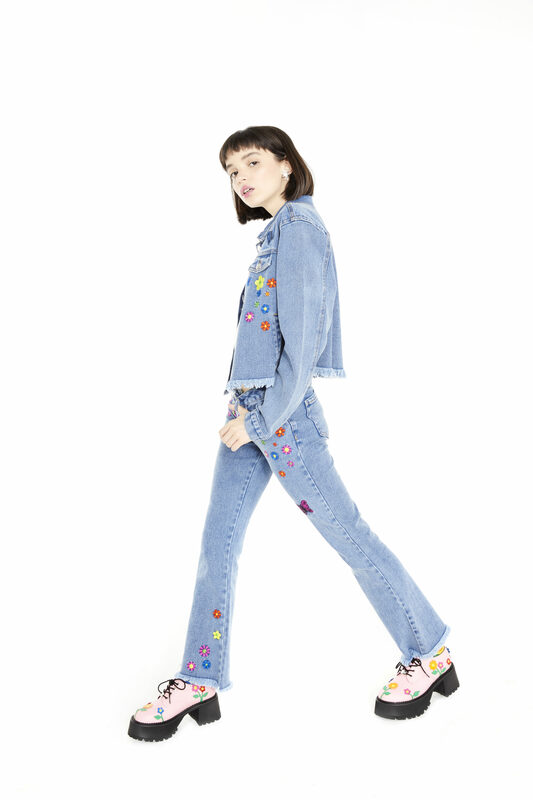 Madelyn Wicks, an associate buyer at Dolls Kill, said the collection really plays off that resurgence while staying true to the Delia’s we know and love. Serving up flower power realness. So on board for this Canadian tuxedo. We’re gonna need this full look, butterfly clips included. You can check out the full collection on the Dolls Kill website.